If you want to continue making strength gains, it's time to introduce some variety into your routine! Some people catch up on the news by reading the newspaper each morning, going online, or watching TV. I prefer to get my news from scientific journals, especially the ones that relate to exercise. What follows is a list of six movements—some combined with advanced training techniques—you've most likely never attempted before. In the spirit of replacing movements that have long gone stale in your training with ones that provide a new stimulus, here are six of my favorites, one for each body major body part. If you're like me and have suffered a torn pec while benching, you'll agree that the barbell bench press isn't ideal. I also find that my shoulders take over when I'm doing flat and incline barbell versions, so I prefer to use the dumbbells instead. In your workout: Do it first through third in your chest workout for sets of 8-12 reps. Get the form down first before using a challenging weight. The weight you normally use for the flat bench dumbbell press will likely be too heavy. Lie back on a flat bench while holding two dumbbells with a standard grip (palms forward), arms extended over your chest. Slowly lower the weights to your outer chest, then press and rotate your hands 180 degrees as you push back up to the starting position. You should have a supine grip with your pinkies inward and palms facing your face at the top of the movement. Hold this peak contraction for two full seconds before lowering into the next rep.
Keep your shoulders back and down during the press to maximize pec involvement and minimize the contribution from your delts. This triset links three single-joint dumbbell movements, each done for 7 reps. It's a great variation to throw into the end of your routine. Remember to keep the weight light in order to maintain proper form. A strong mind-muscle connection is necessary, to maximize every rep. In your workout: Do it last after you've completed all shoulder presses and single-joint delt exercises for each head. This is more of a pumping exercise. Do 3 sets of 21 reps. Remember to keep the weight light in order to maintain proper form. A strong mind-muscle connection is necessary, to maximize every rep.
Start in a bent-over position with your core tight and unlocked. Do not look up. Perform the first 7 reps with an overhand grip (palms facing back). Lead with the pinkies out as you squeeze your rear delts, bringing the weights out wide—this is not a row. For the next 7 reps, stand up, and with your palms facing in, do a lateral raise for the middle delt. The final 7 reps are one again done in the bent-over position. Using the same hammer grip, instead perform a forward raise. Keep the shoulders down as your raise the dumbbells and slowly lower them with control. Hardly anyone does this movement, but they definitely should! Because you'll hit the biceps on the way up and the forearms on the way down, the Zottman curl is a complete biceps and forearm exercise. The positive phase (when you're lifting the weight) focuses on the biceps, while the eccentric phase emphasizes the brachioradialis. In your routine: This movement can bridge your biceps and forearms workouts. Because it can't be done with very heavy weights, do it toward the end of your biceps routine if you don't specifically train forearms. Grip the dumbbells with a supinated (underhand) grip, and curl them like you normally would. Keep your elbows tight to your sides. Pause at the top, rotate your wrists so that your palms now face down, and lower the weights under control. Check your ego on this exercise, drop the weight, and go for quality reps! Muscle Building Protein! Supports The Maintenance And Growth Of Muscle!Go Now! Transform your basic squats into super squats that'll have your legs burning deep—and then growing big! 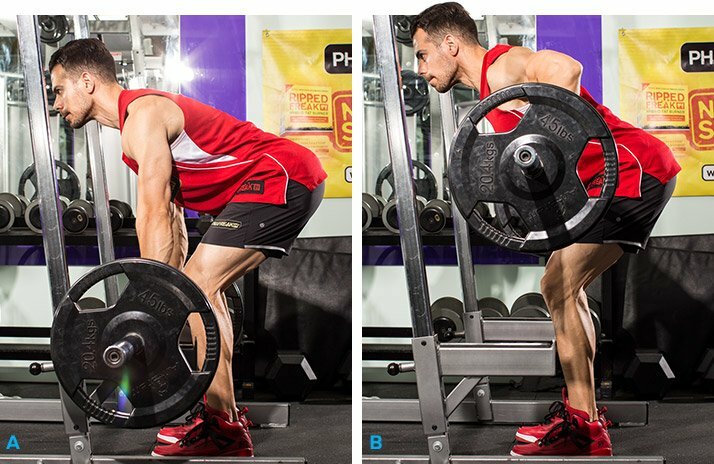 This simple technique will increase your muscles' time under tension and emphasize the crucial bottom range of the squat. By including partial and full-range-of-motion reps, you'll better involve your glutes and hamstrings, which will also make you better at all other types of squats. In your workout: If you're not training for strength, do this method first in your workout for several sets of 6-10 reps. A rep consists of both a full-range and a partial squat. If you're training for strength, do your regular straight sets of squats before trying this variation, but reduce the total number of sets. Transform your basic squats into super squats that'll have your legs burning deep—and then growing big! Set a box (or step or bench) a few feet behind your squat rack, and get into position by loading the barbell onto your traps. The height of the box should be at or slightly below knee level. Position yourself in front of the box with your feet about shoulder-width apart. Lower yourself all the way down to the box, and pause but remain tight. Drive up to the halfway point, then slowly return back down to the box in a controlled fashion. Tap the box, then finish the rep by exploding back up to the starting position. Keep your core tight throughout each phase of the one-and-a-half rep to maintain your positioning and control during the set. Start this row from a dead stop off the rack just off the floor, which breaks the concentric and eccentric phases of the exercise and forces you to recruit more muscle fibers for greater power, development, and growth. Because the bar touches the rack, all elastic energy is released, making it harder to initiate the pull because you're coming from a dead stop, just like conventional deadlifts. This technique will definitely boost your back thickness. In your routine: Do it first for 3 sets of 6-10 reps. Make sure your lower back doesn't round; if it begins to, immediately end the set. Set the safeties at about mid-shin height in a power rack and place a barbell atop it. Load the bar at mid-shin and take a shoulder-width, overhand grip. Keeping your back flat and head neutrally aligned, pull the bar up into your upper abdomen in an explosive manner. Resist the downward pull as you allow the bar to settle back onto the rack. Pause on the rack for a 1-2 seconds to release tension, then repeat. Variation: For an added challenge, add chains to each side of the bar, to alter the strength curve and add progressive resistance throughout the pulling phase. As you pull higher, the bar now becomes heavier. As you lower it, the load begins to diminish. For this exercise, you're doing a traditional bodyweight dip, but you're shifting most of your weight to one side as you extend your arms, then alternating sides. This allows you a bit more overload than you'd normally get with bodyweight dips. 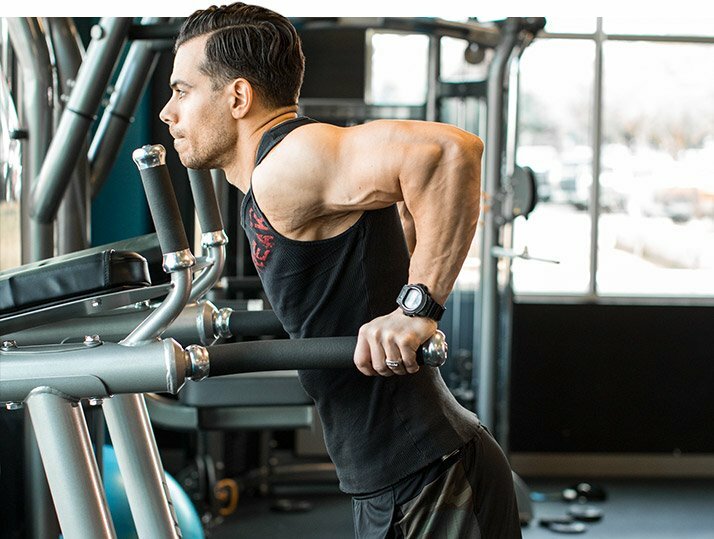 In your routine: If bodyweight dips are easy for you, do this toward the end of your triceps workout. If they're a challenge, do them earlier. Do 3 sets of 8-12 reps.
Start centered on a dip platform with your legs below you and your torso straight up and down—don't lean forward as that variation better targets the pecs. Bend your elbows until your upper arms are parallel to the floor. As you push up, extend so all of your weight to one side. Lower back down and center yourself, and then push up to the opposite side, alternating sides. Promote Muscle Growth & Strength! * Testosterone Support! * Go Now!